Format: Full-cast audio drama starring Tom Baker and Louise Jameson published by Big Finish Productions and released September 2014. Setting: Earth: Sissenden Village & London, England in 1588. Continuity: This story takes place between The Talons of Weng-Chiang and The Horror of Fang Rock and immediately after the audio story The Ghosts of Gralstead. The Doctor refers to the Palace Theater and Leela refers to the muffins that she'd had in Victorian London (see The Talons of Weng-Chiang). The Doctor and Leela both also mention the Toffs (see The Ghosts of Gralstead). The Doctor mentions that he was in Cathay in 1289 (see Marco Polo). He also mentions that he was in Cadiz when Sir Francis Drake "singed King Philip's beard" by attacking the Armada there (see The Flames of Cadiz). The Doctor remembers being imprisoned in the Tower of London before (see The Sensorites). The Doctor mentions that the TARDIS has survived a volcanic eruption (see the Dominators) and a nuclear explosion (see The Claws of Axos). Discussion: The Ghosts of Gralstead had left me with high expectations for this next story. With the same writing team and director I figured that it would be of the same high quality and with a storyline limited to four episodes I figured that this would be perfect for Platt. The story would have space to adequately develop the characters without him having to wonder what to do with an additional two episodes. I was hoping for something a little bit different with this one but much like with The Ghosts of Gralstead, Hinchcliffe and Platt chose to use a story from the original series as a template. Here it's the Masque of Mandragora. This is one of Hinchcliffe's favorite stories from his era but it has never been one of mine and two pseudo-historicals in the same box seemed to be a waste to me. Even if they wanted to use other Hinchcliffe era stories as a basis, that era had modern stories and science fiction. It would have been nice to get some variety. It also would have been nice to have a true departure and go with a true historical. There's certainly enough potential for drama in the Elizabethan era and it would have been nice to hear Leela's opinion on it all. Still, I was ready to give it a shot. My first question is if Doctor Who really needed another "devil" origin story. Pretty much anything that a science fiction series would need to say on the subject was brought up in The Daemons. Even in Hinchcliffe's own Pyramids of Mars they touched on the subject by saying that Sutekh was just another name for the devil. Even the new series has weighed in with yet another devil myth. So now the series feels the need to retread old ground with the Vituperon now being the latest iteration of the devil in Doctor Who. The real issue is that he's not very competent nor is he very scary. He is given a scary and disturbing sounding voice, which counts for a lot in audio but he never really hurts or harms anyone. Even when the Doctor is in his dimension and completely at his mercy what does he do? He just locks him up. The human William Redcliffe does more to hurt the Doctor. It's also not really clear what the "imps" that he sends out are doing. Are they able to influence people mentally? We see them influence a couple of people but it appears to be unique just to the few people who can perceive the imps' presence. Do they just move things around and try to manipulate events because people can't perceive them? If these creatures really have a worldwide influence as the Doctor suggests and which would be important for any kind of plan that would wipe out humanity, why is the particular devil-myth appearance of the horned, goat-footed creature only confined to European folklore? The plot limitations don't stand there. The Doctor rescues the priest only to wait around for Redcliffe to show up and give him his comeuppance but instead is just vaguely flippant to the man and ends up getting captured. Nothing really comes of it except for a torture scene. It seems like it was a disjointed plot strand that ended up getting cut from the script. I had hoped to see the Doctor turn the tables on Redcliffe in some way. Redcliffe himself is a very uneven character. The story gives every indication that he is simply a selfish man using the panic of the war against Spain and the anti-Catholic sentiment to curry favor with the Queen and elevate his own station. Yet at the end it appears that he's actually a true believer who has seen the error of his ways and sacrifices himself so that the Doctor and Leela can get away. While I certainly don't mind his fate I think that the manner in which he reaches it rings tremendously false. Why does Sir Robert think that the Doctor is so important to his plan? He just said that he was at Cadiz, but so were a bunch of other people in Drake's ships. The lengths that he goes through just to have the Doctor present when it puts his own position in jeopardy seems to defy any kind of sense and seems to just be there to hamper the Doctor's efforts to take care of the Vituperon threat. That isn't to say that the actors don't give this one their all. 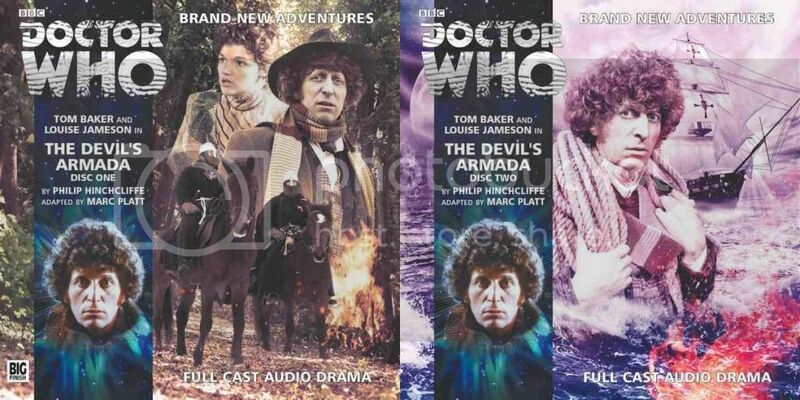 It's clear that Louise Jameson and Tom Baker are still relishing working with Philip Hinchcliffe after all this time. There are some nice scenes for Leela learning the weapons of the era and using a rapier to good effect. It's just to bad that more meat wasn't given to her this time. Most of her lines are confined to "look Doctor, there's an imp in this scene too" without really making any use of the fact that she's from another culture. What would Leela think of the European devil myth? We'll never know. Tom's Doctor feels more like his later self in these. He gets to do some comedy accents and spends far more time being flippant to the alien menace and to authority figures than actually getting something done. It's a shame because although Tom does that sort of thing well, there's far more drama to be mined from this era if they'd just give it a chance. Jamie Newall does a really great job as William Redcliffe. He's every inch the Elizabethan bully who uses his power to persecute others. He plays the cruelty and conceit with relish and definitely becomes one of those villains that you love to hate. Tim Bentnick also throws himself into the role of Ned Bones, the local rabble rouser. Philip Bretherton also stands out as the Vituperon, although so much of his performance relies on the effect to which his voice is treated that it's unclear how much of that scary Vituperon voice is down to him or down to the technology. Ben Porter's role as Father D'Arcy simply requires him to act like a terrified man on the run, something that he pulls off easily. Alix Dunmore and Beth Chalmers have the unenviable task of doing "possessed acting", so it's a bit unfair to criticize them to much. Chalmers unfortunately grates on the nerves as her other role of Lady Jane, one of the queen's ladies in waiting. She's a vacuous woman of court who has unfortunately caught the eye of Nick Harney, played by Joe Jameson. It seems a little odd that Lady Jane seems unphased by Nick's changes in fortune in the story, once it comes out that he's a Catholic but otherwise their love story seems to just be an excuse to give the rest of the Harney's a London connection. The production values are high on this story. The music is once again far more rich than the normal Dudley Simpsonesque score. This time they go for some real Elizabethan style music. The sound effects are also great. The Vituperon leader is downright scary. The imps could be better. They just sound like a bunch of tiny people sniggering all of the time. For the most part, though, everything sounds really good here from the sounds of blade on blade to the ship battle to the sounds of someone being dunked under the water. The one real standout here is that someone seems to have lifted the old AOL Instant Messager sound effects for the door opening and closing. It's very obvious. Each time I heard it I looked around to see where there might be an iPad or iPhone running the instant messager nearby before realizing that the sound was coming from the audio. I laughed the first time but it became increasingly annoying as the story continued. It's such a loud, deep sound and it's weird going from someone talking and sounding like they're across at the other end of the room to a door sound effect that sounds like it's right on top of you with a heavy bass tone. If it was on TV, it'd be like showing someone talking in long shot and then doing an extreme closeup on just the door opening and closing without even showing the person coming or going. It was very strange and definitely disrupted any of the scenes that they used it in. Recommendation: A tired old story idea. Masque of Mandragora may have been one of Hinchcliffe's favorite stories during his run but it's a story concept that gets old kind of fast. The fact that Doctor Who has done this kind of story numerous times doesn't help matters. The plot feels like it's missing some connective tissue and our main human bad guy goes through a redemption that just feels wrong. This is all counterpointed by some nice acting and some mostly wonderful production values. It's a very uneven production. I recommend that you pick up the Philip Hinchcliffe presents set for Ghosts of Gralstead and while you have it you may as well listen to this one as well, but don't expect it to be as good.